The larger than life characters of the Mighty Morphin’ Power Rangers TV series are now Pint Sized Heroes with a Funko touch. Your favorite heroes and villains measure approximately 1 1/2-inches tall. The Mighty Morphin’ Power Rangers Pint Size Heroes Mini-Figure Display Case includes 24 individually packaged mini-figures. Ages 3 and up. Please note: This item may have variants randomly inserted throughout the production run. We cannot accept requests for specific variants, nor can we accept returns on opened items. The item you receive may be different from the one pictured. Please note: Item selection is random. Items are in blind packaging. We cannot accept requests for specific items, nor can we accept returns on opened items. You may receive duplicates. Ages 14 and up. 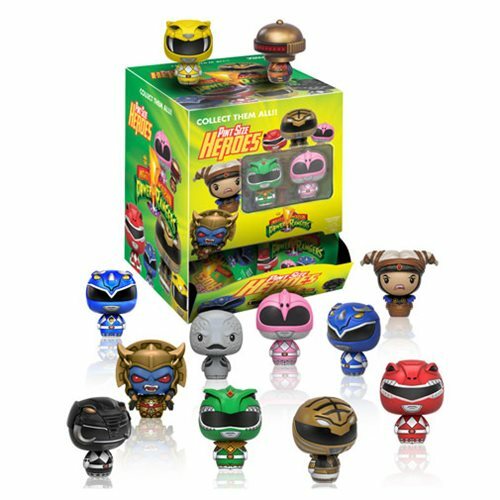 Funko,Power Rangers,Mini-Figures,The larger than life characters of the Mighty Morphin’ Power Rangers TV series are now Pint Sized Heroes with a Funko touch. Your favorite heroes and villains measure approximately 1 1/2-inches tall. Funko, Mini-Figures, Power Rangers, The larger than life characters of the Mighty Morphin' Power Rangers TV series are now Pint Sized Heroes with a Funko touch. Your favorite heroes and villains measure approximately 1 1/2-inches tall.